I am a classically-trained musician with specialized training in new music pedagogy and analysis. My studies in California were predominantly in Western music, but I’m well-rounded with a background in geology, music philosophy and anthropology. 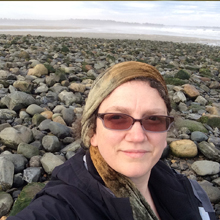 Environmental sounds impact how I connect with the world and create music, so the study of soundscapes and its relationship to diverse ecosystems is a natural fit for my doctoral work. Sounds are so magnificent! Working with our diverse ecosystem recordings, I am using computational musicology approaches, which is essentially exporting musical features as data to quantify environmental changes, such as a spectral quality in a birdsong that is missing in a disturbed area. In addition, my background includes multimedia development and so, assist in our scientific communication efforts via movie editing and design of educational interactive devices. Outside the lab, I spend time with my children and family — hiking and experiencing the beautiful American landscapes — and playing my flute.